Topics: Northeast Church Of Christ, Tennessee Bible College, Audio Bible, and Mt Gilead Church Of Christ. Its 2 nameservers are dns1.multipro.com, and dns2.multipro.com. 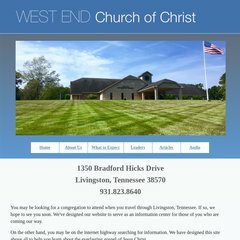 Westendcofc.org's server IP number is 207.65.4.243. Isdnet Inc (Tennessee, Nashville) is the location of the Apache/1 server. PING kramer.multipro.com (207.65.4.243) 56(84) bytes of data. A ping to the server is timed at 25.3 ms.